Desktop: Ikea glass office desk, HP Z200 Workstation, HP 2710m monitor, Logitech Bluetooth mouse and keyboard, Ikea kitchen-ware plate stackers as speaker stands. Taiwan's Firestone Audio is a member of the unofficial Pacific Rim bonsai audio club. Amongst others it includes Trends Audio, Keces and KingRex. These companies all offer class D amps, USB DACs, headphone amps and sundry in cute micro chassis. KingRex eventually outgrew extreme compactness with its more upscale and larger PREference and HeadQuarters units previously reviewed in these pages. Firestone—their earlier models designed by the same folks who now operate competitor Keces—follow suit with their new Libby and Rubby models. Those are a DAC headphone amp and a 50wpc class D integrated with outboard SMPS respectively. With a proliferation of websites ending in .com.tw, .eu, .nl and .com.au, Firestone distribution seems well entrenched. Punters hesitant to mail-order directly from the Far East should welcome proper import houses in Europe and Australia. As a company, Firestone was founded in 2003 under president Jacky Wang. Today this $2.500.000 outfit focuses on the amplifier market for notebooks and desk-top PCs. They are investigating strategic alliances as well as "different business sectors to help increase sales volume and brand awareness. We also offer OEM and ODM services." Named like Californian cheer leaders, Libby and Rubby are available in black or silver. Libby's deeper chassis houses a class A circuit which like the Rubby converts its analog input to digital via TI's PCM 1803A. The reasons for digitizing analog are different for Rubby—that machine applies power processing directly to a digital signal—and Libby where "the most important reason was to avoid a long analog signal trace." Libby's DAC converts to analog with the PCM1793. A PCM2704 handles transceiving for Libby's 16/44.1 USB 1.1 input. 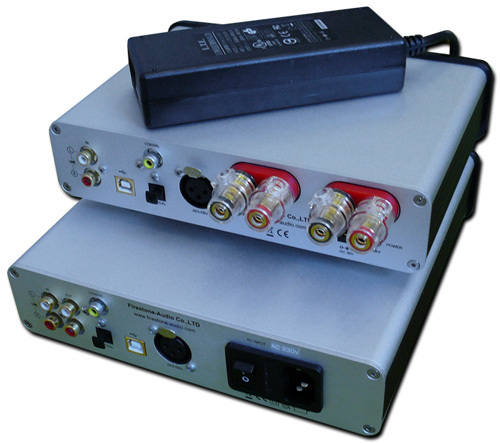 24/96 RCA/XLR S/PDIF plus Toslink couple straight to an SRC 4193 upsampler to enable user selection from 44.1kHz to 192kHz sampling rates in five increments with 16 or 24-bit data density. A plethora of bright lights adorn/deface both components - red for standby, blue for power, green for source and sample rate select, orange for 24-bit word length and mute. In operation, you'll be staring at three or four bright LEDs. Add one for the occasional mute. It's a bit of a Christmas tree effect. A TI-DIR9001 acts as Libby's low-jitter clock recovery system. The "4-step biased" output section is dedicated to the 6.3mm headphone port and fixed outputs and based on the TI TAS5706 chip joined to a TI TAS5086 processor coupled to OP275 op amps and high-current power transistors. On-chip volume is handled by the popular PGA2311 with a discrete mute switch. The belly of the unit has four clearly marked dip switches, two per channel. These adjust output impedance for headphones below 32Ω; 32 - 100Ω; 100 - 250Ω; and above 250Ω. Cans from 16 - 600Ω are copasetic. The benefits of proper matching are quite audible. Be sure you don't forget about this adjustment. 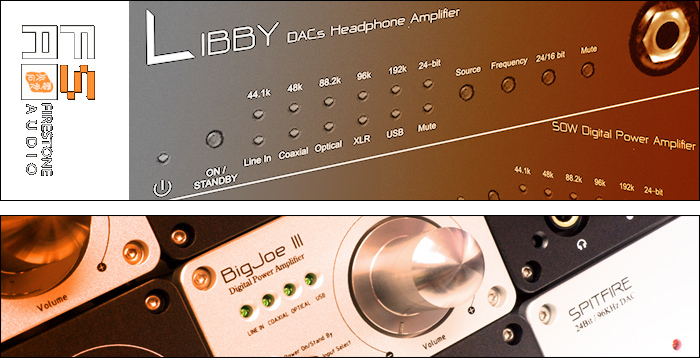 Due to class A bias, Libby's chassis gets so warm that even the metal volume knob heats up. Give it all a bit of breathing room.